Born at the family homestead at Hibbert, Perth County, Ontario on 29 April 1881, son of Frederick J. “Fred” Hooper (1854-?) and Eliza A. Metherall (1857-? ), he attended high school and graduated from the Mitchell Model School. He began his teaching career around 1899 and was a Principal in Bruce County, Ontario (1889-?). During the first few years, he spent his summer months in pursuit of medical training as a country doctor, though his ambition was later abandoned “during a cold snap in one of those Canadian winters, when the snow was deep and the mercury was bobbing up and down on a scale of double figures below zero [Fahrenheit].” Instead, he renewed his interest in education, graduated from the Stratford Collegiate and Ontario Normal School, and worked during the summer months as a travelling salesman across Western Canada as a manufacturing representative for several Eastern Canada companies. In 1904, he was named Principal of Miami School (1904-1906) and is believed to have taught one year (1906-1907) in the area of Townships 5 & 6 of Ranges 5 & 6 West (near the boundary of Rural Municipality of Dufferin and the Rural Municipality of Thompson). During this time, he married Nettie Elliott (1878-1971) in his native Perth County on 27 December 1905 and had two children: Frederick Melvin “Fred” Hooper (1906-?) and Velma Bernice Hooper (1908-?, wife of Roy McCall). They settled at Winnipeg 1907 and he joined the Winnipeg School Division as Principal of Victoria School (1907-1909). He subsequently taught Night School classes at Norquay School (1909) and Winnipeg Collegiate Institute (c1910-c1912, c1914-c1915) where he focused on Mathematics and Latin. Around the time that he transitioned to teaching night classes, he began working as a rental depot manager for C. H. Enderton & Company and entered the real estate business. Eventually operating independently, he reportedly managed several buildings, including the Amulet Apartments, Shipman Court, Parkdale Apartments, and Bannatyne Apartments during the latter part of the decade as well as working as agent of the Canadian National Fire Insurance Company (c1918). He was a charter member of the Assiniboine Club of Winnipeg. In October 1919, he and the family moved to the United States and took up residence at Redlands, California. He returned to Winnipeg several times for business, leisure, and sport, though eventually divested himself of his Winnipeg-based property. He continued to follow his real estate interests, gaining employment (1920) at Redlands as a salesman for A. D. Dike and J. H. Logie (the firm operating as Dike & Logie). He reportedly chalked up over 100 sales in his first year and by January 1922 had formed his own partnership with Verne Mattson, then operating as Hooper-Mattson Realty Company until around 1928. He then partnered with his son, operating as the Hooper Realty Company. Additionally, he dabbled in the field of investments. He was active within the community, as a member of the Redlands City Planning Commission, First Methodist Episcopal Church, Redlands Kiwanis Club, and the Redlands Realty Board, as well as Superintendent of Sunday School at the Grace Methodist Episcopal Church (1920s). His interest in lawn bowling carried over from his time in Winnipeg, as he reportedly brought the sport to his new home at Redlands, there founding the Redlands Lawn Bowling Club on 24 January 1923, and serving as the inaugural President (1923-1927) of the Southern California Lawn Bowlers Association (Vice-President, 1928-? ; later Honourary President). He won numerous championships on the bowling green in both Canada and the United States, including the Manitoba Lawn Bowling Association Eaton’s Trophy in 1936. His decades of active involvement in the sport resulting in an Honourary Life Membership from the South West Division of the American Lawn Bowling Association. He was also President of the Redlands Chamber of Commerce (1943). At the time of his death, he resided at 25 Parkwood Drive. He died at Redlands, California, on 14 May 1971 and was buried there in Hillside Memorial Park. “Changes in city teachers,” Manitoba Free Press, 29 July 1907, page 10. “Many attend night schools,” Winnipeg Tribune, 19 October 1909, page 17. “City and general [Residence sold],” Manitoba Free Press, 24 July 1915, page 10. “Rentals - unfurnished suites - Amulet Apts.” Winnipeg Evening Tribune, 13 March 1917, page 13. “Sublet - 4 rooms [Amulet Apts. ],” Manitoba Free Press, 3 April 1918, page 14. “Redlands,” Redlands News [San Bernardino Daily Sun], 26 January 1922, page 11. “Lawn bowlers hold forth at Redlands,” Los Angeles Times, 28 December 1922, page 35. “Redlands wins first contest,” Redlands News [San Bernardino Daily Sun], 20 January 1923, page 10. “Firm enlarges realty office,” Redlands News [San Bernardino Daily Sun], 2 February 1924, page 14. “Redlands churches,” Redlands News [San Bernardino Daily Sun], 14 June 1925, page 14. “Bowlers seek State honors,” Redlands News [San Bernardino Daily Sun], 7 September 1926, page 12. “Bowling Club will enlarge,” Redlands News [San Bernardino Daily Sun], 23 September 1926, page 14. “Bowler plays English team,” Redlands News [San Bernardino Daily Sun], 27 September 1927, page 12. “Bowling club head elected,” Redlands News [San Bernardino Daily Sun], 12 January 1928, page 12. “Lawn bowling sport adopted by Redlands addicts who support activity in increasing number,” San Bernardino Daily Sun, 16 February 1930, Commercial and Radio Section page 5. “Arrangements made for bowling event by Redlands group,” San Bernardino Daily Sun, 7 June 1930, page 17. “Mr. 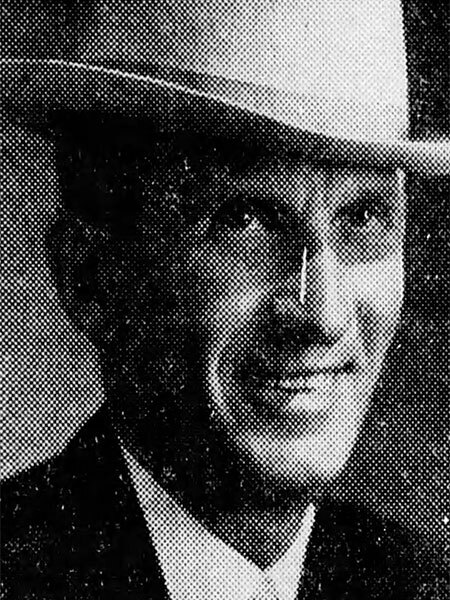 and Mrs. R. H. Richmond,” Winnipeg Tribune, 21 August 1930, page 6. “League wants to run Hooper as candidate,” San Bernardino Daily Sun, 18 March 1932, page 14. “Hooper gives his platform,” San Bernardino Daily Sun, 30 March 1932, page 12. “Mel Hooper goes into jewelry in bowling tourney,” Winnipeg Tribune, 11 August 1936, page 3. “California rink annexes lawn bowling trophy,” Winnipeg Tribune, 14 August 1936, page 10. “Californians highlight of lawn bowling,” Winnipeg Tribune, 1 January 1937, page 14. “Meet your neighbor,” San Bernardino Daily Sun, 7 April 1938, page 15. “Lawn bowlers enter tourney,” Redlands News - Sun-Telegram [San Bernardino Daily Sun], 11 July 1948, page 18. “Lawn bowlers open tourney,” Winnipeg Tribune, 10 August 1948, page 13. “Hospital drive teachers total of $180,936,” Redlands Daily Facts, 30 January 1957, page 4. “Fifteen years ago,” Redlands Daily Facts, 11 January 1958, page 8. “Hooper defeats son to win bowling matches,” Redlands Daily Facts, 19 November 1959, page 8. “For 43 years,” Redlands Daily Facts, 31 December 1963, page 9. “Bowlers give birthday party for Mel Hooper,” Redlands Daily Facts, 11 May 1971, page 6. “Melvin Hooper, 90, Realtor, noted lawn bowler, dies,” Redlands Daily Facts, 15 May 1971, page 3. Death notice, Redlands Daily Facts, 15 May 1971, page 4. “Melvin Hooper, Redlands, ” San Bernardino Daily Sun, 16 May 1971, page 37. “Nettie Hooper, long active in city, dies,” Redlands Daily Facts, 30 September 1971, page 4. “Bowling ...,” San Bernardino Daily Sun, 16 March 1982, page 23. “Redlands Lawn Bowling Club named historic resource,” by Sandra Emerson, Redlands Daily Facts, 24 October 2015.